Sentinel is the only monthly oral preventive that guards against heartworms, adult roundworms, adult hookworms, whipworms, and prevents the development of flea eggs. Sentinel requires a prescription from your veterinarian. NOTE: Sentinel does not kill adult fleas. If you see fleas on your pet, use Capstar Flea Treatment Tablets to quickly kill adult fleas within 30 minutes of administration. 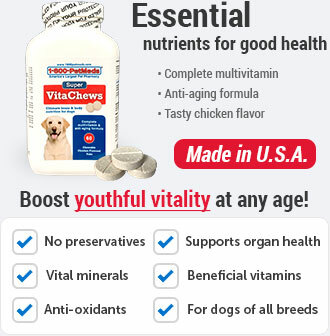 Milbemycin oxime eliminates the tissue stage of heartworm larvae and the adult stage of hookworm, roundworm, and whipworm infestations. Lufenuron, the other active ingredient, is an insect development inhibitor that breaks the flea life cycle by inhibiting egg development. Lufenuron prevents most flea eggs from hatching or maturing into adults and thus prevents and controls flea populations by breaking the life cycle. Sentinel may be given along with Capstar Flea Treatment Tablets, which treats flea infestation and kills adult fleas. Side effects are rare, though some pets may exhibit vomiting, depression, drowsiness, itching, hives, loss of appetite, diarrhea, or seizures, hypersalivation, and weakness. If these or other symptoms develop contact your veterinarian. 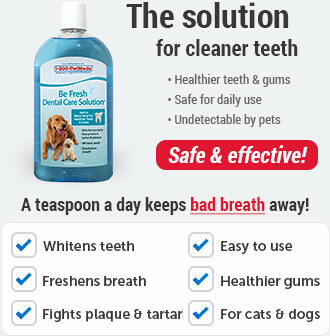 It's important to maintain good personal hygiene, since humans can contract hookworms and roundworms. It's also important to eliminate fleas and to not feed your pet rodents or uncooked meat or fish. To prevent re-infection, clean up stools on a daily basis. Consult your veterinarian for pregnant or lactating dogs. What is the most important information I should know about Sentinel? 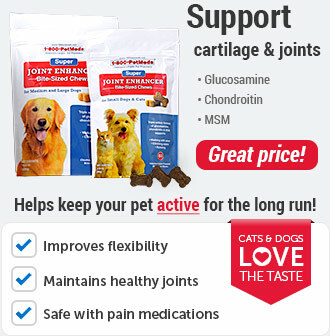 Sentinel is a prescription medication FDA-approved for use in dogs. 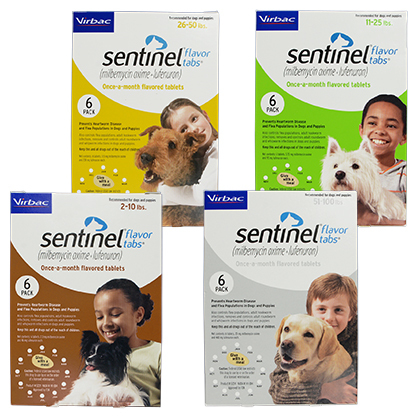 Sentinel is available as artificial beef flavored (derived from pork and soy protein) chewable tablets. This medication should be given once a month year-round. What should I discuss with my veterinarian before giving Sentinel to my pet? How should Sentinel be given? Give Sentinel exactly as directed by your veterinarian. If you do not understand the directions ask your pharmacist or veterinarian to explain them to you. The usual dose of Sentinel for dogs 2 to 10 pounds is 1 Flavor Tab every month (Brown Box), 11 to 25 pounds is 1 Flavor Tab every month (Green Box), 26 to 50 pounds is 1 Flavor Tab every month (Yellow Box) and 51 to 100 pounds is 1 Flavor Tab every month (White Box). 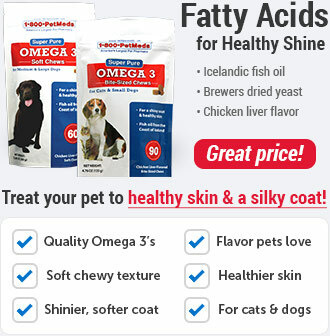 For dogs over 100 pounds give the appropriate combination of tablets. To ensure adequate absorption, always administer Sentinel to dogs immediately after or in conjunction with a normal meal. Heartworm testing should be performed prior to the start of prevention therapy. If your pet is off Sentinel for 6 months or less, re-start the medication and test after 6 months since microfilaria, that take 6 months to mature, will result in a positive test result. Store Sentinel in a dry place at controlled room temperature, between 59-77F (15-25 C). Do not remove the tablet from its wrapper until ready to give the medicine. Keep this medication away from children and pets. Consult your veterinarian for pregnant or lactating dogs. What are the possible side effects of Sentinel? Side effects of Sentinel are rare although some pets may exhibit vomiting, depression, drowsiness, itching, hives, loss of appetite, diarrhea, or seizures, hypersalivation, and weakness. If these or other symptoms develop contact your veterinarian. What happens if I miss giving a dose of Sentinel? If a dose is missed and a 30-day interval between dosing is exceeded, administer Sentinel immediately and resume the monthly dosing schedule. If Sentinel replaces daily diethylcarbamazine (DEC) for heartworm prevention, the first dose must be given within 30 days after the last dose of DEC.
What happens if I overdose my pet on Sentinel? What should I avoid while giving Sentinel to my pet? Because humans can contract hookworms and roundworms from pets, it is important to maintain good personal hygiene. 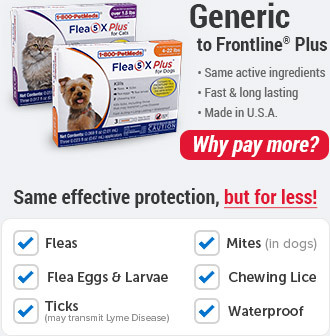 It is also important to eliminate fleas on your pet and in the household. What other drugs will affect Sentinel? While Sentinel is safe to use in dogs at risk for MDRI-allele mutation (Australian Shepherds, Collies, Shelties, etc. 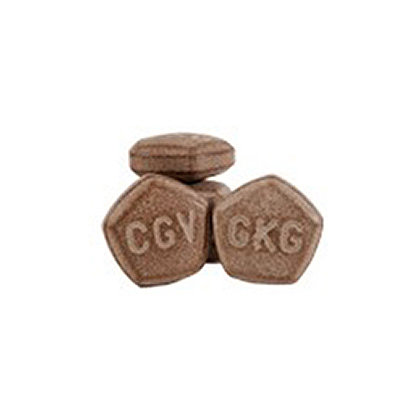 ), unless tested normal, caution is advised if your pet is also being given amiodarone (Cordarone), azole antifungals such as ketoconazole, carvedilol (Coreg), cyclosporine (Atopica), diltiazem (Cardizem), erythromycin (Ery-Tabs) or clarithromycin (Biaxin), quinidine, spironolactone (Aldactone), tamoxifen, and verapamil (Calan). Do not give Sentinel to your pet if already giving an alternate heartworm medication. Give Sentinel Flavor Tabs once a month on the same day of each month year-round. Sentinel Flavor Tabs is for use in dogs only. Do not give to cats. To ensure adequate absorption, always administer Sentinel to dogs immediately after or in conjunction with a normal meal. Sentinel has no effect on adult fleas, but controls flea populations by breaking the flea life cycle at the egg stage. To speed control of flea infestation, products that kill adult fleas like Capstar Flea Treatment Tablets may be used temporarily with Sentinel depending on the severity of the infestation. Treatment may begin at any time of the year. It is important to treat all dogs in the household for fleas. 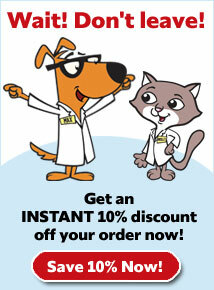 Cats in the same household should be treated with approved products for heartworm prevention for cats. Do not remove Sentinel from its wrapper until ready to give to your pet. Should be stored at room temperature between 59° and 77° F.